We would never begrudge anyone doing whatever it takes to further their career, especially Israeli ad man Tal Schweiger who's looking to land a gig in the States, but Tal, your "hire me" stunt makes no sense. Tal wants insure potential recruiters and agencies that he can spell perfectly in English. 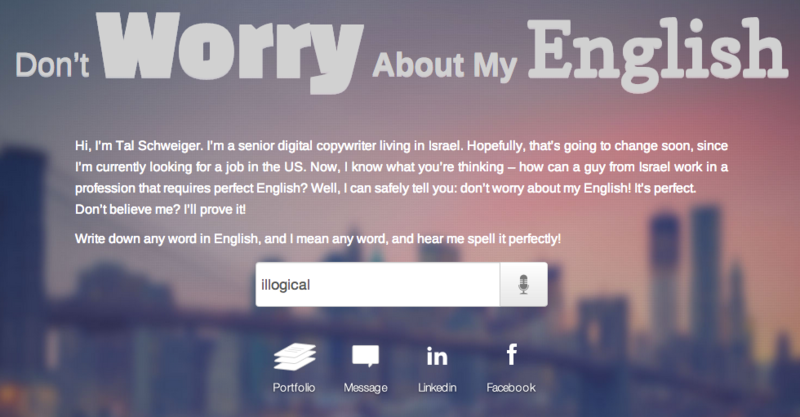 But when his "Don't Worry About My English" page asks people to enter words -- that he (or, more likely, the linguistics program he is using) CAN CLEARLY SEE -- of course he is going to be able to spell the words perfectly. Now if he had site visitors SAY the words instead of spell them out for him, that would be another thing. We hope Tal gets the job he wants but this stunt isn't exactly proving anything.